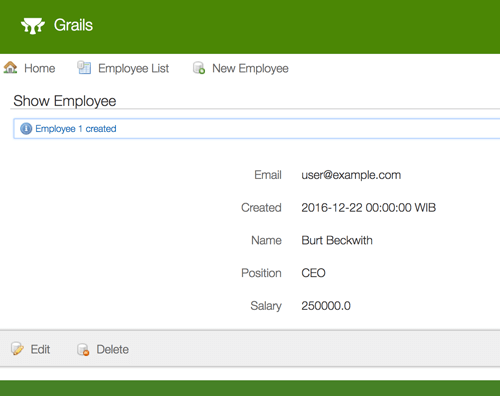 How to creating simple create-read-update-delete (CRUD) web application step by step using Grails 3 framework. Grails is a framework for simplifying the complicated java web development. You can find more details about Grails in here. Don't waste our time, let's jump into a real example. Now, we are creating a web application with crud feature. 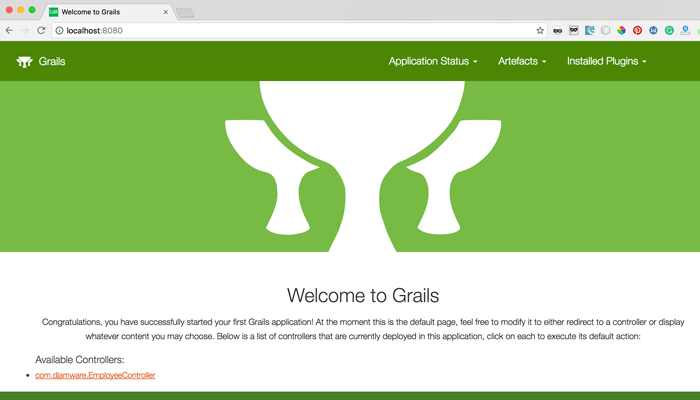 Before we started, just make sure you have installed grails framework. If not installed yet, this must be a good resource for installation. Next, open your console/terminal. Go to your projects folder then type this command to create new grails application. It's mean to create a new application with app name "crud-webapp". Next, go to that newly created application folder. Type this command to enter grails interactive console. In this console type help to view all available grails command. The first step for creating CRUD web application is creating a domain (in MVC it's called Model). Just type this command. That command will create new domain class named "Employee" inside package name "com.djamware". 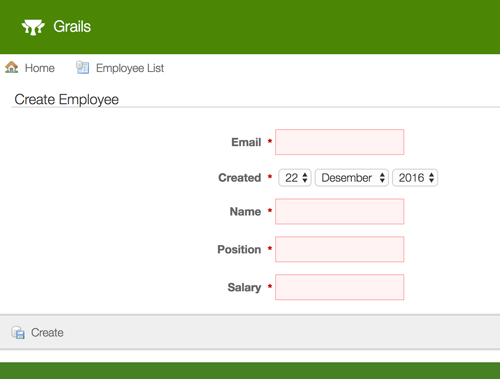 Edit that Employee class in folder crud-webapp/grails-app/domain/com/djamware/Employee.groovy and fill with required data fields like this. Let me explain a little bit. This domain has 5 fields name, email, position, salary and created with different data types. Inside constraints are validation, this time the only email that has validation must be a valid email. By default, if no constraints defined, fields will be a required field. Next, generate a controller and views by this command. This command will create CRUD controller and views for Employee domain. Now, run your app by this command. Open this URL http://localhost:8080 in your browser, and this is default grails view. You see employee controller in the left bottom of the page. Just click on it and you will see this page. 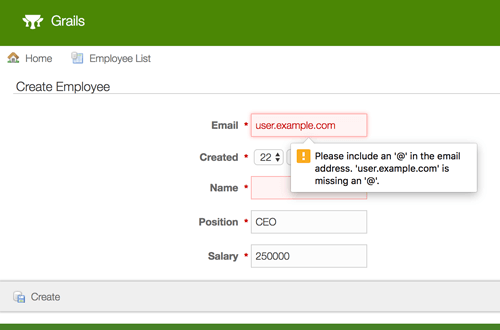 In this CRUD page, just click "New Employee" button to create new employee data. In that employee, form fills data but don't fill as right data to test built in fields validation. Fill email with the invalid email, left the name blank and fill another data. Then click "Create" button, you will see validation works like this. 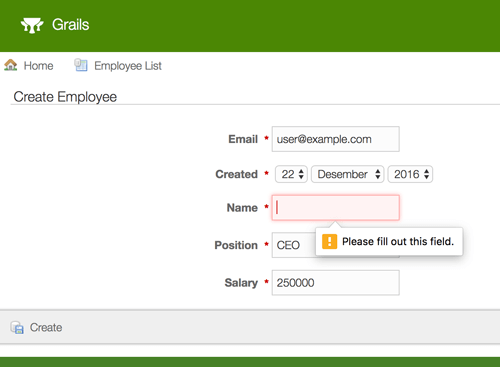 If you filled this form correctly data will be saved and you will see the detail of employee. Click on "Employee List" button to go back to employee page. You will see new data listed. Now, you can try another CRUD function by yourself. You might be asking how and where data saved. Yes, by default Grails 3 use the in-memory database using HSQLDB. You can find this configuration in file crud-webapp/grails-app/conf/application.yml. This line is database configuration by default using h2 or HSQL with help of hibernate as ORM or translator Object to the Database table. For different database configuration, you can change those lines.